This command is set up to work with FireArms, Handweapons, and PlayerControlObjects. While it functions correctly for soldier handweapons, it does not work on PlayerControlObjects or FireArms, thus vehicles can't seem to use it. That is until I did this tweak to the meme file for the ingame HUD. Thus this command must be added to ALL enter-able PCOs used in the mod or else vehicles that are supposed to have no crosshair will end up using the default crosshair since that's the default behavior of the command. If I manage to refine this further, I will post updates on it. In my BFH'42 mod, the crossHairIcon is set to 64x64 size and positioned at 368x268 which is exact center of screen for a 64x64 size element. Thus you can use that size and position to alter the soldier's version so that your vehicle crosshair also has the matching size. The original transform node that the game uses to govern the crosshair size/psoition is the very first transform node in the very first splitNode in the file. It should not be hard to miss. Adjust that to increase size/detail of the crosshairs for both soldiers and vehicles that use the CHTIcon crosshair type. Now that I think about, all it took to fix custom crosshairs for vehicles was two cullNodes under a second transformnode (or splitNode as that node type will work for this too). Guess EA got real lazy with the HUD coding and never properly fixed the crosshair command for PCOs. This would be perfect for a refined version of HomeFront, because Halo is known for having different crosshairs for each weapon. Very nice!! But would you mind posting the updated .meme file with instructions for us noobs? Many mods have different ingame meme file setups. Thus this is something I can't really post a meme file with this pre added. Though I could do one for vanilla BF1942. 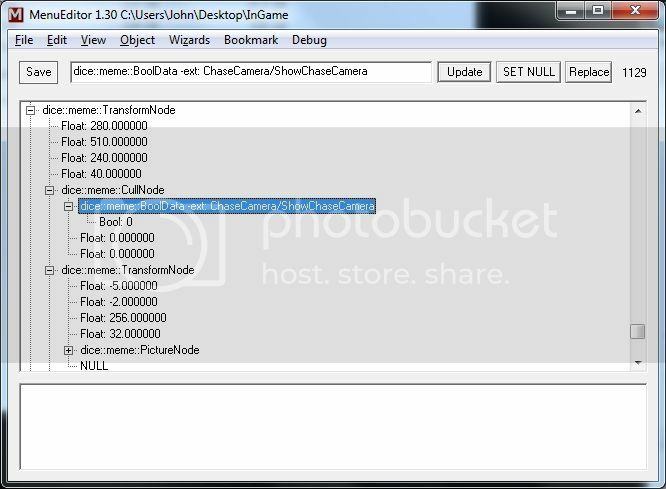 Do you think this meme files can contain the settings that control how the chase camera behaves? I have no clue what this Float values mean, maybe its something else entirely. That is a boolData property on a cull node. It only serves to tell the attached nodes on the host transform node when they should become visible onscreen. The "ShowVehicleIcon" cull node property is what allowed me to enable the custom crosshair system on PCOs since they had code that would pass the texture to the node for it to display. That node booldata settings acts to tell the game when someone has entered a vehicle and to display HUD elements like the vehicle icon. It was just a matter of expanding the criteria for when to display things from that code line and having the attached variable picture node to facilitate that. Don't think the meme system can have a direct impact on object behaviors though. The menu can do most things relating to the HUD. It can be modified to allow more then 6 weapon slots on a kit and extend other the range of other things. But I don't think it can directly impact the behavior of an object or object class like a Camera. The per-vehicle crosshair system works because the game already had code that enabled it. Dice just never implemented the correct node settings in the MEME files so that they would be visible. Apache Thunder wrote: Many mods have different ingame meme file setups. Thus this is something I can't really post a meme file with this pre added. Though I could do one for vanilla BF1942. Sweet! Could you please do that? I set this up to enable full screen HUDs for vehicles (and handweapons if you so desire since the crosshairIcon command also works with handweapons). Note the edited version of the hk.dds texture. I included the DDS file since the game can't load a DDS file with the resolution I needed (was a non power by 2 resolution) so the game can be forced into loading the TGA file. If you had only included the TGA, the game would still use the DDS file from vanilla BF1942 in your custom mod. So be sure to include both! Because if you don't you'd see the vanilla crosshair icon take up the whole screen and that would certainly look odd. I included a example edit of the willy to add a crosshair to the driver seat. Also note how the crosshair in the hk.tga file is positioned. If you want non fullscreen crosshairs you can use this as a reference point for how you should center the crosshair. The resolution of your custom crosshair icon must be 800x600 with your small crosshairs centered in the middle. Fullscreen huds you have more leeway with. Those can be any resolution you want so long as the aspect ratio (4:3 in this case) is the same.